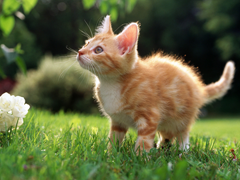 Jigsaw puzzle N21: Ginger kitten. Free online jigsaw puzzles. As a senior citizen was driving down the freeway, his car phone rang. Answering, he heard his wife"s voice urgently warning him, "Herman, I just heard on the news that there"s a car going the wrong way on 280. Please be careful!" "Heck," said Herman, "It"s not just one car. It"s hundreds of them!" The oldest known goldfish lived to 41 years of age. Its name was Fred.